Peppermint Schnapps is a liqueur which has a taste somewhat similar to that of a candy cane. Its flavor is similar to Creme de Menthe, but is not as sweet and is generally clear in color. There are many peppermint schnapps brands available at the market, at various prices and qualities. The choice of which one to purchase may depend on your budget and your intended purpose. For example, if you plan to drink the schnapps straight (without a mixer), you may want to invest in a nicer, expensive schnapps. On the other hand, if you want to make peppermint schnapps cocktails, or plan to use it as part of a recipe for cooking, then you would probably be ok purchasing a more reasonably priced, or cheap schnapps which doesn’t necessarily require a light, smooth taste. Peppermint Schnapps is made from a combination of pure grain alcohol and peppermint leaves. It’s alcohol content can vary anywhere from 15-50 ABV or 30-100 Proof. While you will probably buy a pre-made schnapps, it is also possible to make peppermint schnapps yourself, using a combination of store-bought grain alcohol, peppermint leaves, and sugar. For more information about making your own schnapps, see the peppermint schnapps recipes. Schnapps originates from the region of Europe which includes southern Germany, Switzerland and Austria (where it is called Schnaps). Originally, the beverage was made by fermenting fruit such as pears, plums, apples, and cherries for a period of a few weeks. The schnapps commonly known in America today are the product of a grain alcohol and added flavors. The non-traditional schnapps come in a large variety of flavors including: peppermint, peach, pear, apple, banana, raspberry, butterscotch, cinnamon, coffee and many more. Peppermint schnapps can be enjoyed before a meal as an apéritif, to stimulate the appetite, or after a meal as a digestive, to aide in digestion. 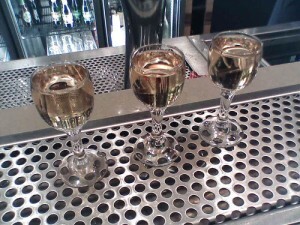 There are many cocktails, both hot and cold, as well as shots, that can be made using peppermint schnapps. Some of the most well-known cocktails include: the peppermint patty, peppermint kiss, adult hot chocolate, alpine sprite, candy cane cola, lemon mint, Bavarian coffee, among others. The peppermint plant is actually a mix between watermint and spearmint plants, and is originally from Europe. In addition to its use in various foods and drinks, the oil which is extracted from the plant also has a history of medical, and other surprisingly non-culinary applications. Although peppermint is the main flavoring ingredient in peppermint schnapps, it is possible to use other types of mint as well. In fact if you grow your own mint in your home garden, it’s even possible to cross-pollinate your types of mint to come up with a truly uniquely flavored schnapps. As always, please remember to enjoy wines and spirits in moderation.